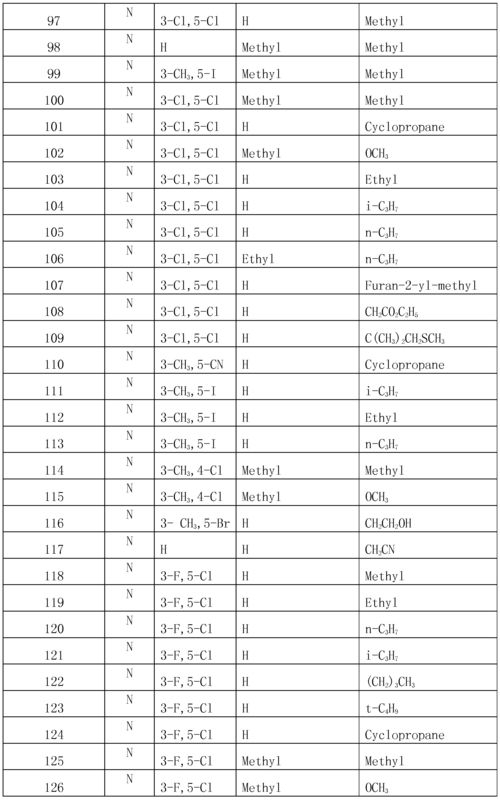 Fluoromethoxypyrazole anthranilamide compounds of formula (I) or agrochemical salts thereof, as well as synthesization methods and uses thereof. The compounds of formula (I) have broad-spectrum insecticidal activities and are effective to pests of lepidopteron (such as Plutella xylostella), hemipteran (such as Aphis medicaginis), homopteran (such as Nilaoarvata lugens) and the like. Agricultural preparations including compounds of formula (I) and methods of preventing and controlling pests are involved. 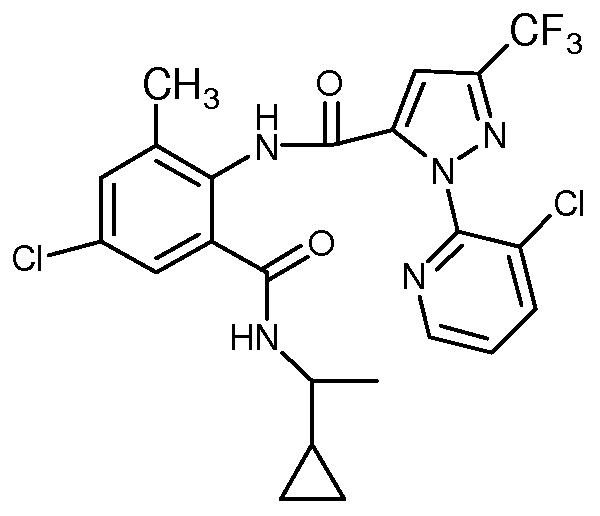 O carboxamido benzamides (Ryanodine receptor inhibitors) are developed in recent years in the control of animal pests tapered ridge insecticidally effective. Object of the present invention to provide a novel pest control agent, can control a problem in the field of various agricultural and horticultural pests or pests parasitic on animals, with high pest at low doses control effect. R 2 is halogen, cyano, d-Ce alkyl or haloalkyl group dC 3. R 2 is halogen or cyano. As RR 2 or R 4 is halogen or halogen as the substituent include fluorine, chlorine, bromine or iodine atoms each. Examples of the halogen substituents may be 1 or 2 or more, in the case of 2 or more, respective halogens may be the same or different. Further, the halogen substitution position may be any position. RR 2, R 3 or alkyl or alkyl moiety R 4 may be linear or may be branched. Specific examples thereof include, d- such as methyl, ethyl, propyl, isopropyl, butyl, t-butyl, pentyl, hexyl and the like 6 alkyl group. Alkenyl or alkenyl moiety in R 1, may be either straight chain or branched eleven kinds. Specific examples thereof include vinyl, 1-propenyl, allyl, isopropenyl, 1-butenyl, 1,3-butadienyl, 1-hexenyl such C 2 - block or block group moieties of R 6 1, may be either straight chain or branched eleven kinds. Specific examples thereof include acetylene group, 2-block group, 2-block basis, a block group such as 3-hexyl C 2 - 6 group of blocks. Containing a difluoromethoxy-pyrazol o carboxamido benzamides represented by the above formula (I) in such isomers may exist optical isomers, geometric isomers, the present invention comprises different isomer and the isomer mixture of the two cases. Further, within the technical knowledge in the art, the present invention also includes various isomers other than the above. Further, although depending on the type isomer may result in different chemical structure of the case is formed with the above-described structural formula (the I), but as long as it can be sufficiently skilled in the art recognize that this is a relationship between isomers, and therefore was a clear within the scope of the invention. n is an integer of 0~4. R 2 is hydrogen, halo, C r C 6 alkyl, halo C r C 6 alkyl, C r C 6 alkoxy, halo C r C 6 alkoxy or cyano; m is 2; n is 1. R 2 is halogen, cyano, alkyl or haloalkyl CFCE dC 3 alkyl. The present invention also provides a method for synthesizing ortho-carboxamido benzamides containing a difluoromethoxy-pyrazoles represented by the above formula (I). 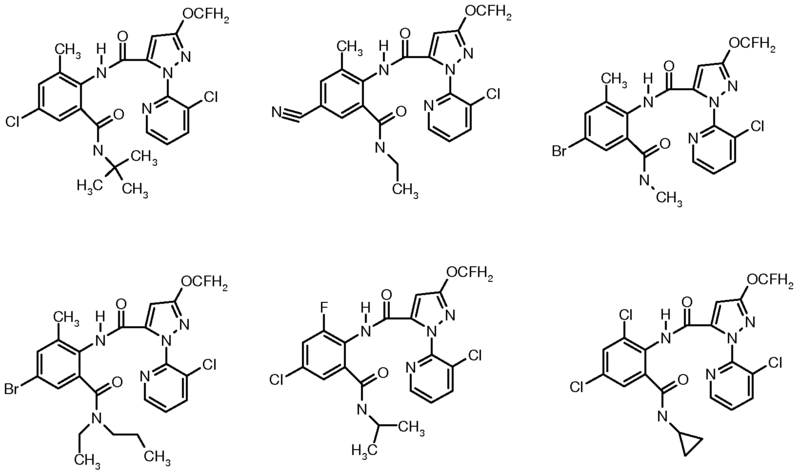 Containing a difluoromethoxy compound A of formula (II) to (YD) represented, RR 2, R 3, R 4 and R 5 groups, and m and n are as defined and preferred above structural formula (I) represented by o pyrazole compound carboxamido benzamides, wherein the structure represented by the formula (VI),! ^ To ^ - 6 alkyl. 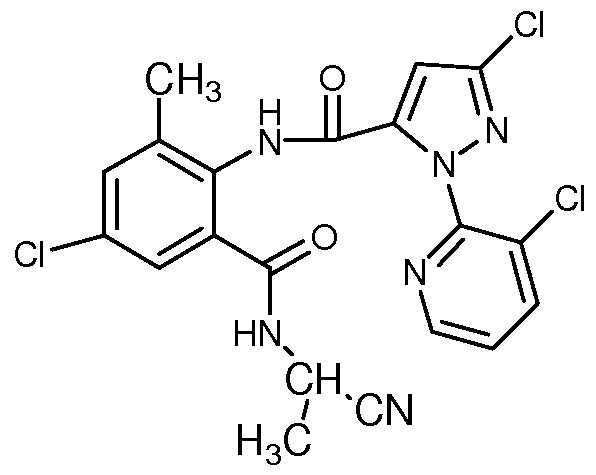 Compound represented by the formula (VI) is a known compound which can be prepared with reference to PCT Patent Application WO03015519 and WO2006023783. As a preferred embodiment, the synthetic method of step (1), a compound represented by the structural formula (VI) with a ratio of a methyl bromide and fluorine feed acid scavenger substance is 1: 1.1~2: 1.1~2, more preferably 1: 1.1~1.5: 1.1~ 1.5; the aprotic solvent is selected from tetrahydrofuran, acetonitrile, 1, 4-dioxane, acetone or one or two or more thereof; reaction temperature is 10~90 ° C , more preferably 20~80 ° (:. Step (1) treatment after the compound represented by formula (W) are: filter cake was rinsed with a small amount of an organic solvent, the filtrate was combined and concentrated. You need not be directly isolated and purified in step (2) hydrolysis reaction. As a preferred embodiment, the synthetic method of step (2), the structural formula (W) represents a ratio of the feed material with an alkali compound is 1: ~ 1.5, more preferably 1: 1~1.2; said protic solvent is methanol and / or ethanol; reaction temperature is 10~90 ° C, more preferably 20~80 ° (:. Step (2) containing a post-treatment difluoromethoxy-pyrazole carboxylic acid represented by the formula (III) are: an organic solvent distilled off, water was added, extracted with ether, the aqueous phase was then made acidic with dilute hydrochloric acid, large amount of solid precipitated was filtered, washed with water, dried infrared light, to obtain a structure represented by formula (III) containing a difluoromethoxy-pyrazole carboxylic acid solid. Difluoromethoxy containing a pyrazole carboxylic acid and formula (V) represents a substituted anthranilic acid and the alkyl chloride feed as a preferred embodiment, the synthetic method of step (3) the structure of formula (III) represented by ratio was 1: ~ 1.5: 2 to 3, more preferably 1: 1~1.2: 2~2.5; said alkyl sulphonyl chloride methanesulfonyl chloride; the aprotic solvent is selected from tetrahydrofuran, acetonitrile, , 1, 4-dioxane, diethyl ether or toluene, one or two or more thereof; the base is an organic base, an organic base and more preferably a self triethylamine, pyridine or 3-methyl pyridine or two or more thereof; reaction temperature is -30~80 ° C, more preferably -15~30 ° C. Wherein the volume of the amount of the organic base containing a pyrazole carboxylic mass difluoromethoxy-1 to 4 times (ml / g) represented by the structural formula (III), preferably 1 to 2 times (ml / g). Step (3) post-processing is: the reaction was filtered, the filter cake was washed with water, a mixed solvent of organic solvent and water and a small amount of an organic solvent to give a first batch of washed solid; the filtrate was distilled off the solvent, adding an organic solvent, no after drying over anhydrous sodium sulfate, filtered, concentrated, and recrystallized from ethanol to give a second batch of solid; two batches of solid were combined to give a compound represented by the structural formula (II). Substituted anthranilic acid represented by the structural formula wherein (V) is a known compound, can be prepared by a number of methods, can refer to the following documents: Organic Synthesis, Coll.Vol.79, pl96 (2002); Vol.l0, p23 (2004); Adv.Heterocycl.Chem.1975, 18, 1 -58; Journal of the Brazilian Chemical Society 2001,12 (3), 273-324; Angew.Chem.Int.Ed.Engl.1980, 19,222-223 . 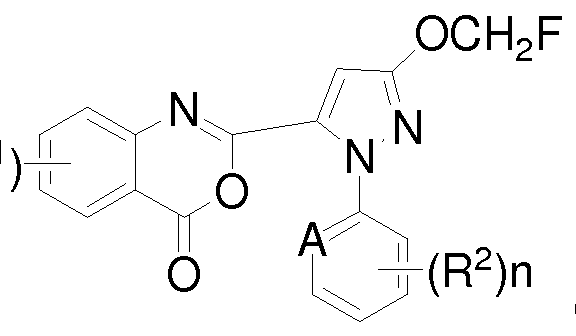 As a preferred embodiment, the synthetic method of step (4), containing a difluoromethoxy-4H- benzo pyrazole represented by the structural formula (Π) [1, 3] oxazin-4-ones and structural formula ( IV) the feed ratio of the compound represented substance is 1: 1 ~ 5, more preferably 1: 1 to 2; said aprotic solvent is selected from tetrahydrofuran, acetonitrile, 1,4-dioxane, diethyl ether, toluene , methylene chloride or chloroform, one or two or more thereof. Which contains a difluoromethoxy-pyrazol-4H- benzo volume amount of aprotic solvents are of the formula ([pi) represented by [1, 3] oxazin-4-5 to 60 times the mass of the ketone compound (ml / g), preferably from 5 to 20 times (ml / g). 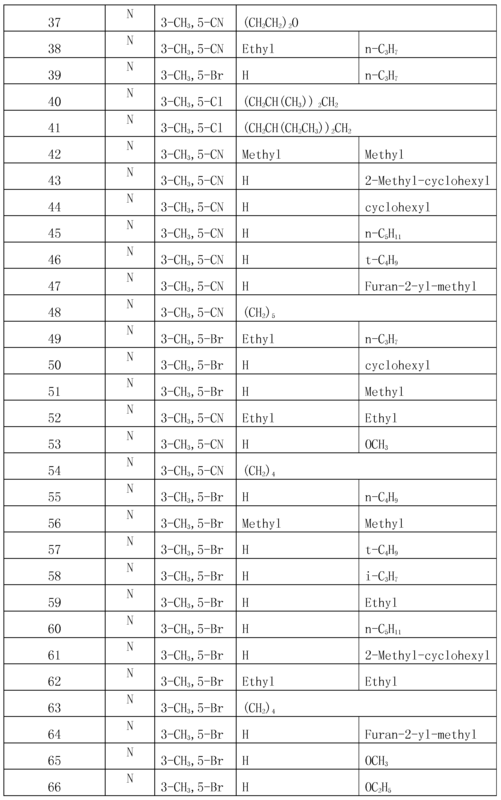 The following abbreviations in Table 1 using an index as follows: t is tertiary, n being normal, i is iso, s is secondary, Me is methyl, Et is ethyl, Pr is propyl, Bu is butyl; corresponding i- Pr is isopropyl and the like. 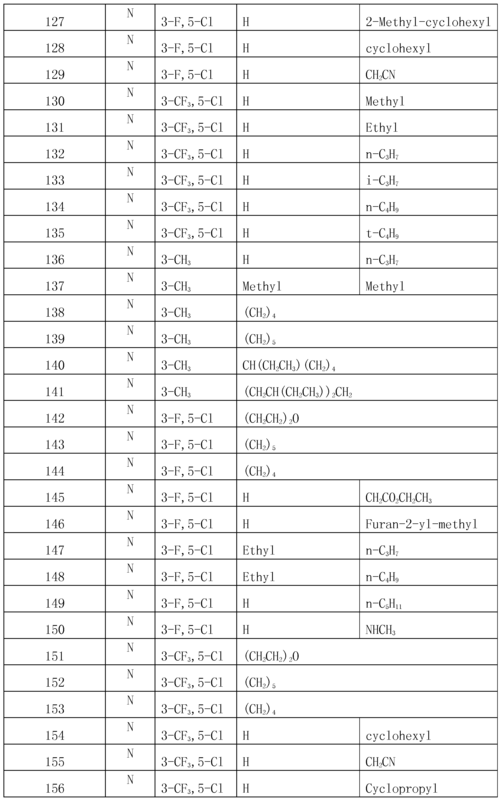 Index Table 1 R 2 = 3_C1, n = l, R: and R 4 may be independent substituents may be integrally connected. DMS0-d 6:.. 89-0 95 (m, 3H), 1. 11-1 97 (m, 9H), 2. 20 (s, 3H),. 1-5. 94 (d, 2H), 6. 98-7. 34 (m, 4H), 7. 81-7. 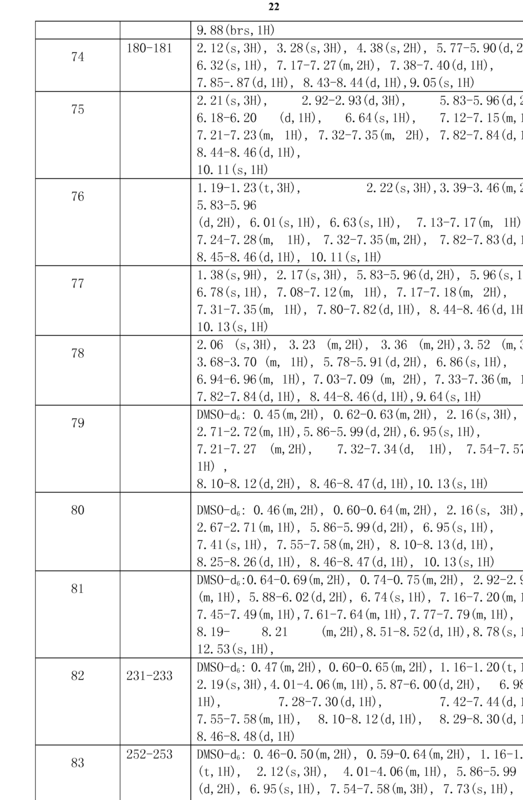 82 (d, IH), 8. 43-8. (D, 2H), 6. 16 (brs, 1H), 6. 99 (s, 1H), 7. 19-7 · 35 (m, 3H), 7. 82- 7. 84 (d, 1H), 8. 43-8. 45 (d, 1H), 9. 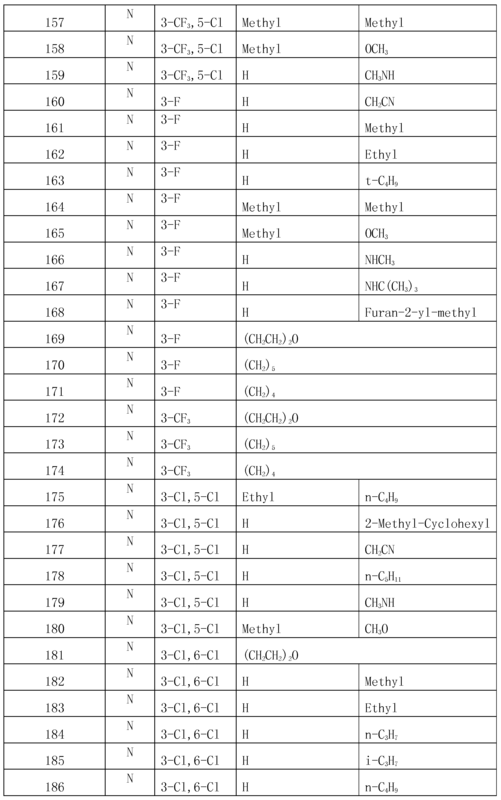 82 (brs, 1H) compound represented by the structural formula (I) according to the present invention, index table index table 1 and 2 may be listed according to the present patent specification preparation Example 1-3 synthesis and synthetic methods described embodiments synthesized. 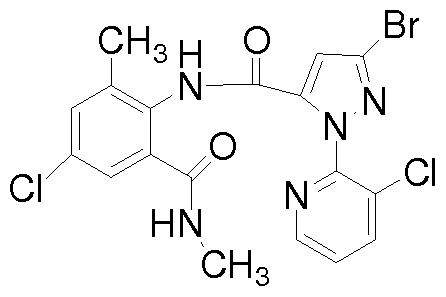 The present invention further provides a containing ortho-carboxamido-benzoyl-pyrazol-difluoromethoxy-use of amine salts of a compound represented by the structural formula (I) or an agriculturally suitable pesticide formulation for controlling pests and a method for controlling harmful organisms. O-aminobenzoyl carboxamido containing a difluoromethoxy-pyrazole amine compound or an agriculturally suitable salt of pest control agent comprising the present invention represented by the structural formula (I) can be used to control pests on crops, e.g. as a problem in the agricultural and horticultural fields of various pests control agent, namely agriculture gardening pest control agents, parasites or animal pest control agents, namely animal parasitic biocontrol agents are particularly useful. As the agricultural and horticultural pest control agents such as insecticide, miticide, it is useful, in particular, for the prevention and treatment of mite Tetranychus urticae, Tetranychus urticae, citrus, Panonychus ulmi and other plant parasitic mites; Plutella xylostella, Mamestra brassicae, Spodoptera litura, cotton bollworm, tobacco budworm, tobacco moth, rice leafroller, rice Adoxophyes, codling moth, peach moth solid, Grapholita molesta , black cutworm, potato beetle, cucurbit, aphids, whiteflies, thrips, locusts, and other agricultural pests like leafminers class. Wherein the agricultural and horticultural use containing the compound of the present invention, pest control agents, particularly effective for agricultural insect pests and the like. Further, ortho-carboxamido benzamides agricultural and horticultural or agriculturally suitable salt containing a fluorine-containing-methoxy-pyrazolo the present invention represented by the structural formula (I) with the pest control agent for the prevention and treatment of organophosphorus agents, carbamate agents, various drug resistant pests pyrethroid active agent. Further, the present invention is represented by the structural formula (I) containing a difluoromethoxy-pyrazol o carboxamido benzamides or agriculturally suitable salt thereof having excellent penetration metastatic because, by containing it is present agricultural and horticultural compound of the invention represented by the structural formula (I) by treating the soil pest control agent, while the control of harmful soil insects, mites and the like can also control pests like stem portion. Carboxamido-containing o-aminobenzoyl as a difluoromethoxy-pyrazole amine compound or other preferred aspect agriculturally suitable pest control agent containing a salt of the structural formula (I) of the present invention represented by the above the integrated control of the above-mentioned plant parasitic mites, agricultural insect pests, soil insect pests such as agricultural and horticultural pest control agents. Carboxamido containing o-aminobenzoyl difluoromethoxy containing a pyrazole amine compounds suitable for agricultural and horticultural agriculturally the present invention represented by the structural formula (I) or a salt thereof with the pest control agent is typically mixed with the compound various adjuvants on pesticide i.e. carrier to form dusts, granules, wettable powders, granules, wettable powders, aqueous suspensions, oily suspensions, aqueous solutions, emulsions, pastes, aerosols, and the like dispersed in trace various forms of formulation is used, but the object of the present invention as is appropriate, the formulations may be made of all forms normally used in the art. As an adjuvant used in the formulation may include diatomaceous earth, mixture of slaked lime, calcium carbonate, talc, white carbon, kaolin, bentonite, kaolinite and sericite, clay, sodium carbonate, sodium bicarbonate, mirabilite, zeolite, starch other solid carriers; water, toluene, xylene, solvent naphtha, dioxane, acetone, isophorone, methyl isobutyl ketone, chlorobenzene, cyclohexane, dimethylsulfoxide, N, N - solvent dimethylformamide, dimethylacetamide, N- methyl-2-pyrrolidone, alcohol or the like; fatty acid salt, a benzoate, an alkyl sulfosuccinate, a dialkyl sulfosuccinate acid salts, polycarboxylic acid salts, alkyl sulfate salts, alkyl sulfates, alkylaryl sulfates, alkyl diglycol ether sulfates, salts of alcohol sulfuric acid esters, alkyl sulfonates, alkylaryl sulfonate, aryl sulfonate, lignin sulfonate, alkyl diphenyl ether disulfonate, a polystyrene sulfonate, alkyl phosphates, alkylaryl phosphates, aryl phosphates , styryl aryl phosphate, a polyoxyethylene alkyl ether phosphates, Such anionic salt of polyoxyethylene alkylaryl phosphoric acid ester salts, naphthalenesulfonic acid formaldehyde condensate surfactant or developing solvent; sorbitan fatty acid esters, glycerin fatty acid ester, polyglycerol fatty acid esters, fatty acid alcohol polyglycol ether, acetylene glycol, block belongs alcohol, an oxyalkylene block polymer, a polyoxyethylene alkyl ether, polyoxyethylene alkyl aryl ether, a polyoxyethylene styryl aryl ether, polyoxyethylene ethylene glycol alkyl ethers, polyethylene glycol, a polyoxyethylene fatty acid esters, polyoxyethylene sorbitan fatty acid esters, polyoxyethylene glycerol fatty acid esters, polyoxyethylene hardened castor oil, a polyoxypropylene fatty acid such ester nonionic surfactant, developing solvent; olive oil, melon wow kapok oil, castor oil, palm oil, camellia oil, coconut oil, sesame oil, corn oil, rice bran oil, peanut oil, cottonseed oil, soybean oil , rapeseed oil, linseed oil, tung oil, liquid paraffin or a vegetable oil such as mineral oil. These various ingredients adjuvants, without departing from the object of the present invention can be appropriately selected or two or more kinds. Further, this may be selected from among materials known in the art suitable adjuvants in addition to the above. It may also be used, for example, extenders, thickeners, dust-reducing agents, antifreeze agents, dispersing various adjuvants conventionally used stabilizer, a phytotoxicity reducing agent, and a fungicide. 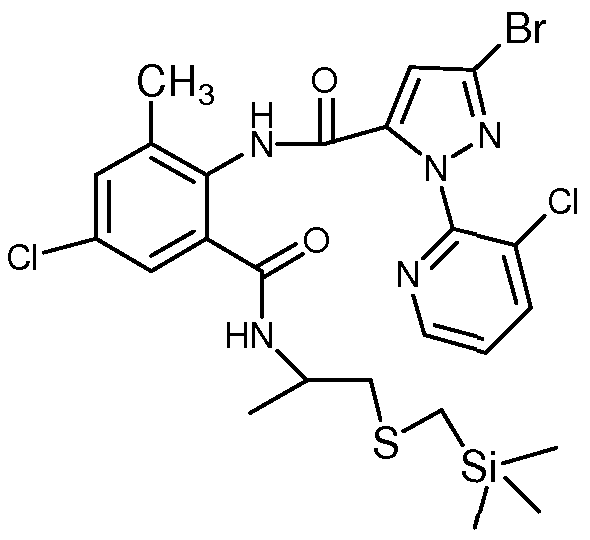 The present invention is represented by structural formula (I), i.e., various adjuvants and a blending ratio by weight of the carrier is usually 0.1: 9~90 99.: 10. When the actual use of these formulations can be used directly, or diluted to a predetermined concentration with a diluent, and various spreaders may be added as needed (a surfactant, a vegetable oil, mineral oil, etc.) used. Comprising the present invention represented by structural formula (I) agricultural and horticultural compound with administration of pest control agent, in accordance with weather conditions, preparation form, application time, the kind of application properties, pests or condition like occurs varies, not uniformly It is, but generally 0. 05~800ppm, preferably 0. 5~500ppm concentration of active ingredient to be administered, it is administered in an amount per unit per 1 hectare compounds of the invention l~5000g, preferably 10~1000g. Further, another preferred embodiment of the agricultural and horticultural pest control agent of the present invention comprising administering pest control agent, may be administered in accordance with the above-described pest control agent. The present invention also includes pest control methods using such methods of administration, especially plant parasitic mites, agricultural insect pests of the control methods. Comprising the structural formula (I) of the present invention is a compound represented by the agricultural and horticultural pest control agents of various formulations used, or a dilution thereof is administered usually be administered using a method generally performed for example spreading, spraying, spraying (misting), fog of (a tomizi ng), granule applicators, submerged application method, soil application (such as mixing or irrigation) or surface application, dipping bait (as coating, dust coating or covering) or the like. Further, the above-described mixing the active ingredient administered to livestock feed servo, it may also hinder the pests in their excrement, especially the occurrence of harmful insects and fertility, may additionally use a small amount of a so-called ultra-high concentration walking method (ultra low volume) administration, in the method, the formulation may contain 100% of the active ingredient. Further, the present invention comprises the structural formula (I) compounds may be represented by the use of a conventional insecticidal, fungicidal or herbicidal pesticides, or combination of two kinds or more, show more beneficial effects of the action. In particular the mix or combination of the present invention of formula (I) and a compound represented by other pesticide active ingredient compound of one kind or a mixture of two or more pest control composition, the scope of application may be, during the chemical treatment, prevention activity other improvements in the right direction. Further, the compounds of the present invention and the other active ingredient compound of the pesticide can be mixed formulations were prepared at the time of spreading, together may also be formulated using both, the present invention also includes such a mixed pest control composition . In 500ml three neck round bottom flask were added 1- (3-chloro-2-pyridinyl) -1H- pyrazole-3-hydroxy-5-carboxylate (13.35g, 0.05mol), 300ml of acetonitrile, the solid carbonate potassium (8.28g, 0.06mol), a fluorine monobromomethane (8.48g, 0.075mol), then heated to reflux until starting material disappeared the reaction was cooled to room temperature, filtered, the filter cake was rinsed with 2 * 50ml acetonitrile, and the filtrate was concentrated after the addition of methanol to dissolve 200ml, then slowly added dropwise 50ml containing aqueous sodium hydroxide (2.4g, 0.06mol) at room temperature, stirred at room temperature for about 30min, the reaction was complete, solvent was distilled off, water was added with diethyl ether 2 * 50ml extraction, the addition of dilute aqueous hydrochloric acidic PH value, the system generates a large amount of white solid was filtered, dried infrared lamp to give 3-- difluoromethoxy-1- (3-chloro-2-pyridinyl) -1H- pyrazole-5-carboxylic acid 11.05g, m.p. 149-151 ° C, yield 81.6%; ¾NMR (400MHz, DMSO- d 6) δ5.84-5 · 98 (d, 2H), 6.74 (s , 1H), 7.62-7 · 65 (m, 1H), 8. 19-8 · 21 (d, 1H), 8.53-8.54 (d, 1H), 13.65 (br, 1H); m (%): 270 (100). 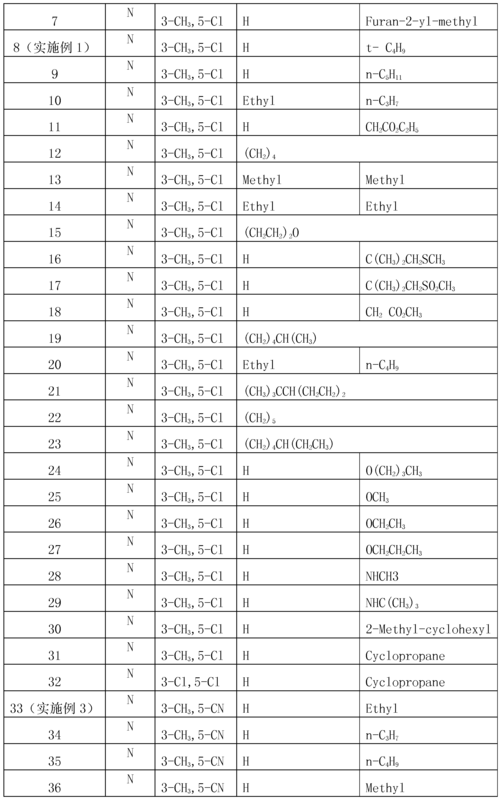 In 250ml three neck round bottom flask, 3-- fluoro-methoxy-1- (3_-chloro-2-pyridinyl) lH-pyrazole-5-carboxylic acid (3g, O. Ollmol) (1- Synthesis Example step product), 2-amino --5- chloro --3- methylbenzoic acid (2.04g, O. Ollmol), acetonitrile 150ml, 7 ml of pyridine, was stirred to dissolve all the solids, the system was cooled at _5 ° ~- 10 ° was added dropwise methanesulfonyl chloride (2ml, 2.96g, 0.026mol) / 20ml acetonitrile solution, after the addition was complete, kept at _5 ° ~- 10 ° LH reaction, then naturally raised to room temperature for 3h, after completion of the reaction , add water 30ml, stirred for 30min, filtered, the filter cake was washed with 2: 1 acetonitrile / water (2 * 40ml), acetonitrile (2 * 20ml) and ether (2 * 20ml) was rinsed to give the first batch of solid; the filtrate was evaporated after the solvent, water was added, extracted with ethyl acetate (3 * 40ml), the organic phase was dried over anhydrous sodium sulfate, filtered, concentrated and recrystallized from ethanol to give a second crop of solid, two batches of solid were combined to give 6 - chloro-2- [3_- difluoromethoxy-1- (3_-chloro-2-pyridinyl) - 1H-5- pyrazolyl] -8-methyl - 4H- [d] [1, 3] benzoxazin-4-one 4. 17g, m.p. 206.0-207.5 ° C, yield 84.22%; ¾NMR (400ΜΗζ, CDC1 3) ^ 1.81 (s, 3H), 5.83-5.97 (d, 2H), 6.85 (s, lH), 7.46-7.49 (m, 2H), 7.84-7.99 (m, 2H), 8.54-8.56 (d , 1H); M (%): 421.0 (100). 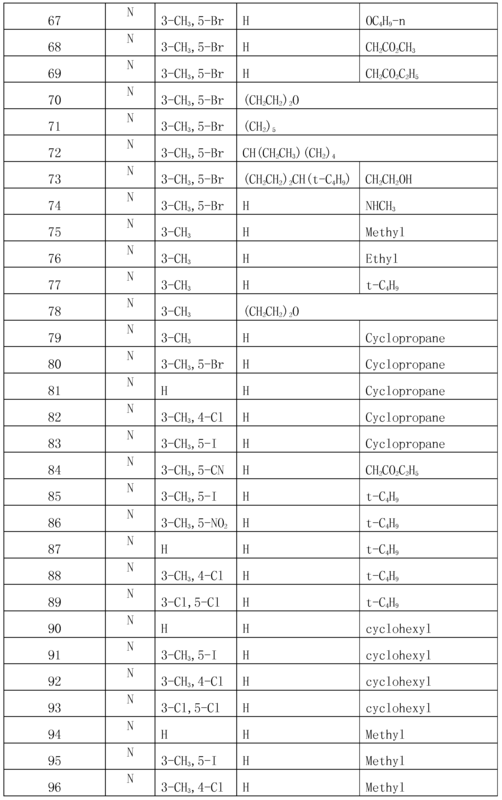 In 50ml single neck round bottom flask, 6-chloro-2- [3-- difluoromethoxy-1- (3-chloro-2-pyridyl) - 1H_5_ pyrazol-yl] -8-methyl _4H - [d] [1, 3] tetrahydrofuran-benzoxazin-4-one (lg, 0. 00238mol) (product of Step embodiment synthesis Example 1_) was slowly added dropwise tert-butylamine (0. 21g, 0 . 00286mol), stirred overnight at room temperature, the reaction was completed, tetrahydrofuran was evaporated under reduced pressure, the residue was added with a little ethanol. after stirring a few minutes, filtered to give a white solid 1. 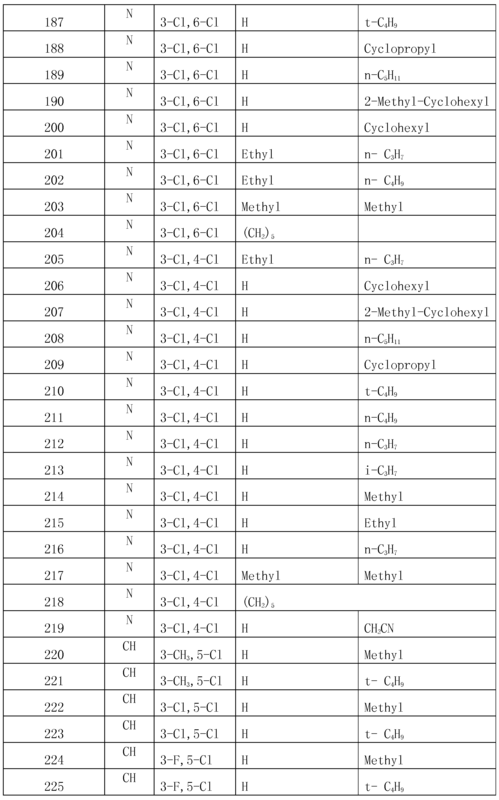 02 g, namely 2- (3-chloro-2 - pyridinyl) -2H- pyrazol -5-- difluoromethoxy-yl - (2-tert-butyl-carbamoyl-4-chloro-6-methyl-phenyl) - 3_ carboxamide, m.p. 227.0-228.0 ° C, The yield was 87 · 6%; ¾NMR (400MHz , DMS0_d 6) ^ 1.26 (s, 9H), 2.16 (s, 3H), 5.84-5.98 (d, 2H), 6.93 (s, lH), 7.26-7.58 ( m, 4H), 8.10-8.13 (m , lH), 8.45-8.46 (d, 1H), 10.10 (S, 1H); m (%): 492. 5 (100). Example 2 N- [2- (methylamino) -4-chloro - 6-methyl - phenyl] -1- (3-chloro - 2-pyridyl) -1H -3-- fluoromethoxy - pyrazole-5-carboxamide (compound 3) in 50ml single-necked round-bottomed flask, 6-chloro-2- [3-- difluoromethoxy-1- (3-chloro-2-pyridinyl) - 1H_5_ pyrazol-yl] -8-methyl _4H- [d] [1, 3] benzoxazin-4-one (lg, 0. 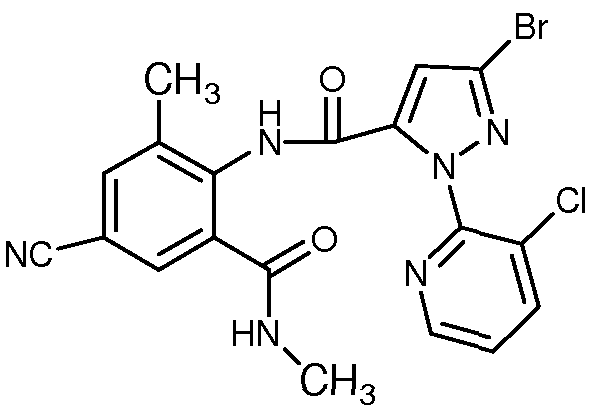 00238mol) (synthesis Example 1_ second stage product) in tetrahydrofuran was added methylamine hydrochloride (0. 19g, 0. 00286mol) and anhydrous sodium acetate (0. 24g, 0. 00286mol), stirred overnight at room temperature, the reaction was completed, tetrahydrofuran was evaporated under reduced pressure, the residue was water was added, extracted with ethyl acetate, the organic phase was dried over anhydrous sodium sulfate, filtered, and concentrated to give crude product, a white solid was recrystallized from ethanol to give 0. 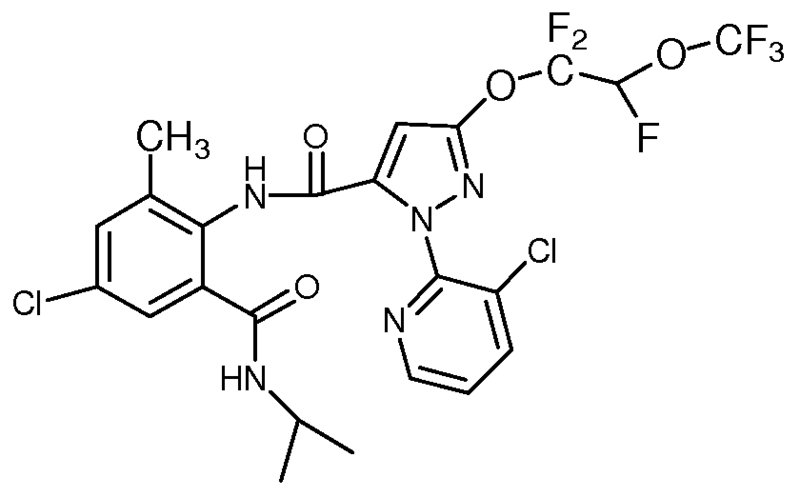 87 g, namely N- [2- (methylcarbamoyl) 4-chloro-6-methyl-phenyl] -1 - (3_-chloro-2-pyridinyl) -1H- -3-- difluoromethoxy-pyrazole-5-carboxamide, m.p. 236.0-237.4 ° C, yield 82. 7%; ¾NMR (400MHz, DMSO- d 6) δ 2.18 (s, 3H), 2.93-2.94 (d, 2H), 5.83-5.96 (d, 2H), 6.16-6.17 (d , lH), 6.70 (s, lH), 7.20-7.36 ( m, 4H), 7.82-7.84 (d, lH), 8.44-8.45 (d 1H), 9.96 (S, 1H); M (%):. 450. 0 (100). In 250ml three neck round bottom flask, 3-- difluoromethoxy-1- (3-chloro-2-pyridinyl) lH-pyrazole _5_ acid (5g, 0. 0185mol) (Synthesis Example 1_ first stage product), 2-amino-cyano _3_ _5_ methylbenzoic acid (3. 24g, 0. 0185mol), acetonitrile 150ml, pyridine 15ml, and stirred to dissolve all solids, the system was cooled, _5 ° ~- 10 ° was added dropwise methanesulfonyl chloride (4ml, 5.98g, 0.052mol) / 20ml acetonitrile solution, after completion of the dropwise addition, reaction was maintained lh at _5 ° ~- 10 °, then naturally raised to room temperature for 3h, after completion of the reaction, water 30ml, stirred for 30min, filtered, the filter cake was washed with 2: 1 acetonitrile / water (2 * 40ml), acetonitrile (2 * 30ml) and ether (2 * 30ml) was rinsed to give the first batch of solid; the filtrate was distilled off the solvent, water was added, extracted with ethyl acetate (3 * 40ml), the organic phase was dried over anhydrous sodium sulfate, filtered, concentrated and recrystallized from ethanol to give a second crop of solid, two batches of solid were combined to give a light yellow solid 4.17 g, namely 6-cyano-2- [3_- difluoromethoxy-1- (3_-chloro-2-pyridinyl) - 1H-5- pyrazolyl] 8- yl _4H- [d] [1,3] benzoxazin-4-one, m.p. 208.5-211.0 ° C Yield 54.87%; ¾NMR (400MHz, CDC1 3) δ 1.86 (s, 3H), 5.84-5.97 (d, 2H), 6.90 (s, lH), 7.27-7.98 (m, 3H), 8.32 (s, lH), 8.55-8.56 (d, lH); M (%): 411.1 (100). 60% of Compound (8) (index table 1), 2% polyvinyl pyrrolidone, 12% sodium naphthalene sulfonate formaldehyde condensate, 8% N- methyl -N- oleoyl - taurate, 2% of carboxymethylcellulose, and 16% kaolin clay were uniformly mixed, smash, kneaded together with the water added for granulation 10-100 mesh sieve granulator, and then dried, sieved (mesh network range). To obtain 60% water dispersible granule product. Example 7 The following Example 14 to give compounds of the invention are given below bioassay were instances, be noted that the present invention is not limited within the scope of the following examples. Test compound with acetone / methanol: After dissolving (11) in a mixed solvent, diluted with distilled water containing 0.1% Tween 80 to the desired concentration. ta lugens), clover leaf miner (r / o) and Phaedon (Phaedon cochleariae. Hereinafter "mg / L" are per mg of active substance / l.
Test statistics: statistical dead insects were each treated and the number of live insects, mortality was calculated. Potted cotton (2-3 single leaf stage) spray of the agent processing, dry. Into the culture room and cultured normal. 5, 12, the blade 19d cut with scissors, placed in 09cm plastic dish, then cotton bollworm, a release paper, stamped. Placed under observation room, test results after 6d. The mortality was calculated according to the above formula mortality. Insect also be seen as abnormal death. Index Table 3 Compound 1, 8, 10, 33, 36, 49, 51 to give 100% mortality at 20mg / L time. Compound 8, 10, 33, 51 to give 100% mortality in 4mg / L while. The potted cabbage (photos 3-4 leaf stage) spray of the agent processing, dry. Into the culture room and cultured normal. 5, 12, the blade 19d cut with scissors, placed in 09cm plastic dish, then Phaedon or 2 instar larvae of Plutella xylostella, a release paper, stamped. Placed under observation room, examination results 6_7d. The mortality was calculated according to the above formula mortality. Insect also be seen as abnormal death. Index Table 3 Compound 1, 8, 10, 33, 36, 49, 51 to give 100% mortality at 20mg / L time. Compound 3, 8, 33, 51 to obtain at least 90% mortality at 4mg / L while. Compound 8 0. 8mg / L obtained when at least 90% mortality. 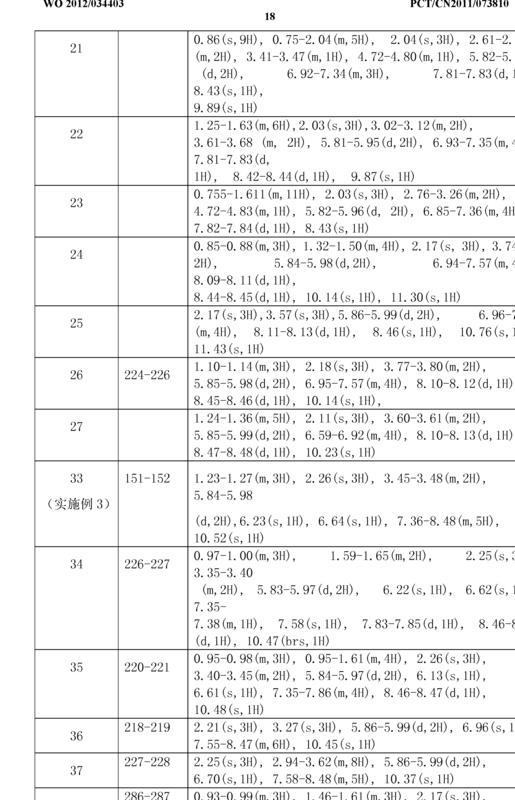 According to the above method, the compound 8 and selection known compound chlorantraniliprole Plutella xylostella were killed, brown rice and alfalfa aphid fly results in Table 3. 0.16 80,402,010 20 0.032 0.8 040 Conclusion: lepidopterous pests Plutella respectively, of Hemiptera Aphis at 20mg / L at a dose of 4mg / L at a dose of 0. 16mg / L dose of the Homoptera rice brown planthopper; compound 8 of the present invention (Example 1) was superior to known pesticidal active compound chlorantraniliprole. 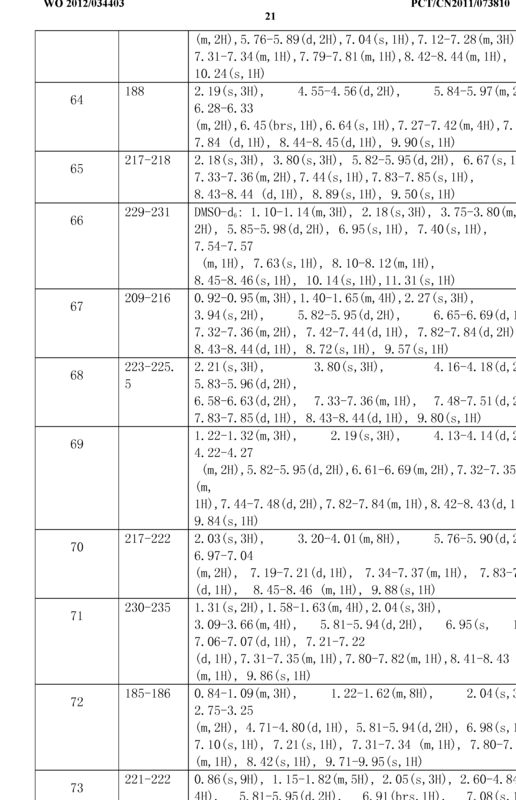 A, RR 2, R 3, R 5 groups, and m and n are as defined and R 4 of claim 1. 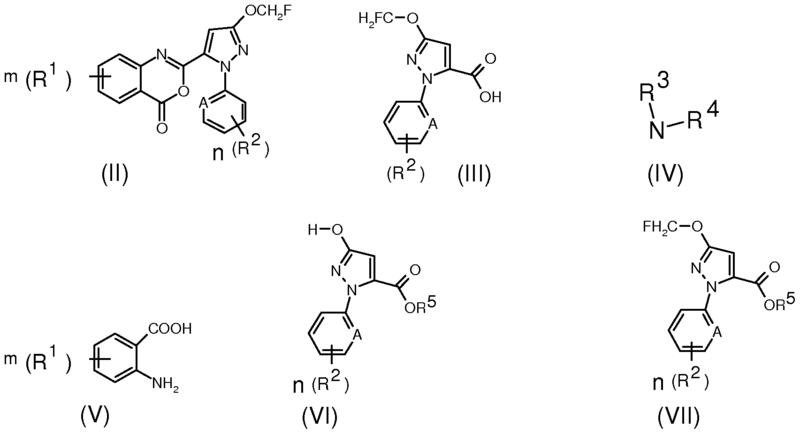 Compound feed material in step (4) containing a fluorine-methoxy-4H- benzo pyrazole represented by the structural formula (Π) [1, 3] oxazin-4-ones and structural formula (IV) represented by the equivalent ratio of 1: 1 ~ 5, the aprotic solvent is selected from tetrahydrofuran, acetonitrile, 1,4-dioxane, diethyl ether, toluene, chloroform, dichloromethane, or one or two or more thereof. 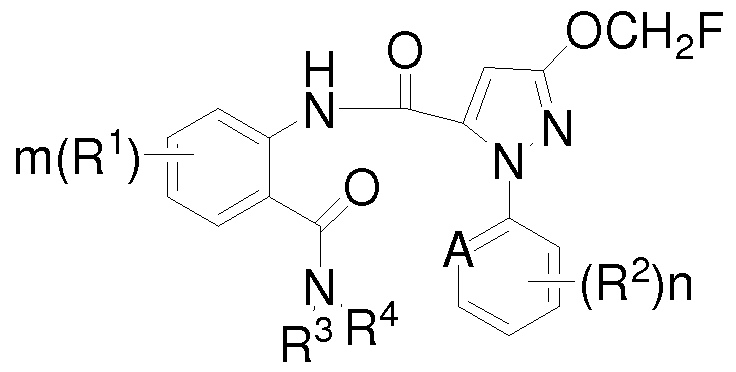 Compound feed material in step (4) containing a fluorine-methoxy-4H- benzo pyrazole represented by the structural formula (Π) [1, 3] oxazin-4-ones and structural formula (IV) represented by the equivalent ratio of 1: 1 ~. 13, o-aminobenzoyl carboxamido containing a difluoromethoxy-pyrazole amine compound or an agriculturally suitable salt thereof, such as the use of a formula (I) according to claims 1 to 12 represented by their characterized in that the structure (I) are used to control pests on crops. 14. A pesticide formulation of pest control, comprising: an amine-containing compound containing an ortho-carboxamido-aminobenzoyl difluoromethoxy-pyrazole or a salt thereof according to structural formula (I) according to claim 1 represented by as an active ingredient and pharmaceutically agriculture, forestry, public health carrier, wherein the weight ratio of the active ingredient and the carrier is 0.1: 99. 9~90: 10. 15. A method for controlling pests, characterized in that: according to claim 14 pesticide formulation applied to the medium to be controlled or the growth of harmful organisms, wherein the effective amount of active ingredient is from 10 to 1000 grams per hectare g.
16. A method of controlling pests, which Laid wherein: containing a fluorine-containing o-methoxy-pyrazol-carboxamido benzamide compound represented by the structure according to formula (I) according to claim 1 and conventional kill one kind of insects, pesticides bactericidal or herbicidal or in combination of two or two or more.